The Sustained Spheromak Physics Experiment (SSPX) carried on at Livermore (see [Wood et al., 2004]) has the primary goal of testing whether favorable energy confinement scaling can be obtained in a spheromak plasma sustained by coaxial helicity injection. Plasma temperatures of about 200 eV are reported, at plasma densities around 1020 m-3, with confinement times around 0.2ms. The plasma radius is about 0.23 m and the discharge duration up to a few milliseconds. The results of the Swarthmore College Spheromak Experiment (SSX), in operation since 1996, has shown among other things that spheromak formation is governed only by gun physics and is independent of flux conserver dimension. The SPHEX experiment [Rusbridge et al., 1996] was conducted at the University of Manchester (U.K.) from 1989 to 1997. The main issues considered were: the division of plasma into a high-electric-field central column and a low-electric-field toroidal annulus; investigation of the global (n = 1) mode responsible for carrying energy and helicity from the central column to the annulus; and the MHD dynamo driving the current in the annulus. 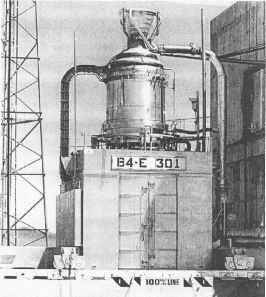 In the last years of activity the reactor was equipped with a central rod to improve stability.